An attitude that I suspect came straight from life. As with many equine practices, the backward seat resulted from a misguided attempt to do the right thing by the horse. 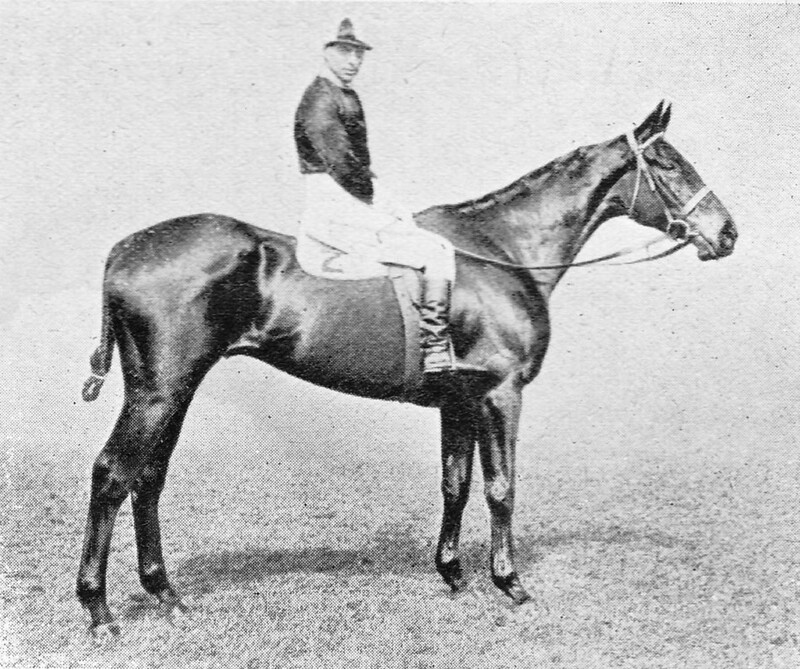 It resulted from the incorrect assumption that for the horse to land front legs first over a jump was very bad for it. 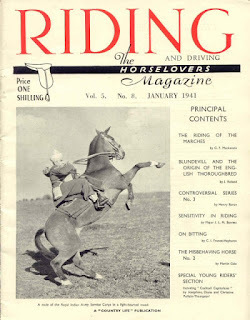 Leaning backwards on landing was intended to remove any strain on the horse’s front legs and encourage it to land hocks first, but what it often did in practice was result in a severe jerk on the horse's mouth, and a rider thumping down on its tender back. If you are so young you have not come across the backward seat, it is illustrated below in a somewhat surprising 1970s illustration commissioned by Armada, by which point the backward seat was vanishingly rare. The horse in this illustration might well have its ears forward, but I doubt it would have in real life. The whole weight of the rider is leaning back against that horse's mouth. Through the wonders of Youtube, we can see some rather dramatic real-life examples of the backward seat in this 1924 video. (Watch from 0:29 on). It was earlier experiments in photography that brought about the forward seat at the turn of the 19th century. Photographs of the horse frame-by-frame meant that Italian cavalry officer, Federico Caprilli, was able to study how the horse jumped. 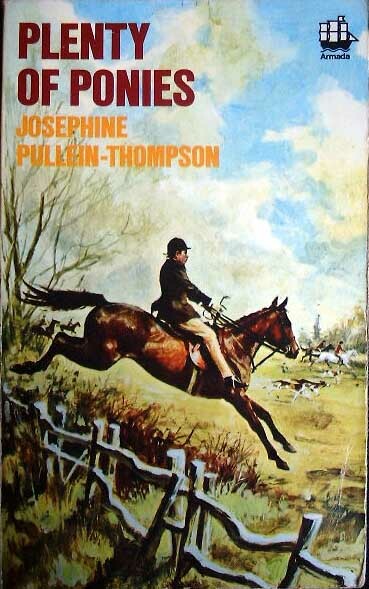 He realised that the horse always landed on its front legs (unless things were going dramatically wrong), and that leaning forward and not jerking the horse’s mouth on landing was considerably better for both horse and rider. 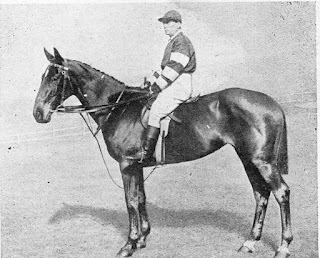 His theories were soon taken up by the Italian military establishment, and spread around the continent, helped by the fact that Italian equitation teams began to do very much better in international competition than those retaining the backward seat. Indeed it was: and on reading the article it seems that the existence of the forward seat was not, after all, at issue (perhaps a disappointment to those picking up the magazine, frothing at the mouth and delighted in the expectation of revisiting an old controversy). It was instead a convenient hook on which to hang Henry Baron's strong and particular dislike of the incorrect interpretation of the forward seat. He shudders at people indulging in what he calls 'exaggerated horse-show stunts'. 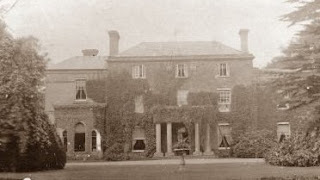 Summerhays, in his commentary on the article, obviously feels that these things are not done in the best circles, and declares that such antics are not seen at Dublin, Olympia, The Royal or Richmond. Perhaps not, but they appeared in the previous month's Riding in an article on the correct use of the martingale. Baron objects to people riding with rounded backs, ‘allowing themselves to be propelled in every kind of posture way up into the ether’, and with a lack of controlled balance. He compares English riders (perhaps the Scots and Welsh were better – we are not told) with the best continental riders, who he says, have a slightly hollow back: ‘control of the legs, body and of the head in particular is their secret’. 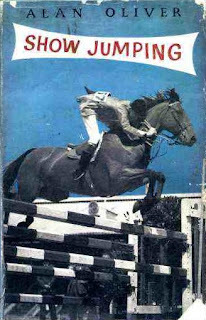 But there was a small, but definite cadre of show jumpers over the decades to come for whom the word 'exaggerated' could have been coined. Alan Oliver chose a particularly dramatic photograph of himself for his book, Show Jumping, which appeared in 1957. 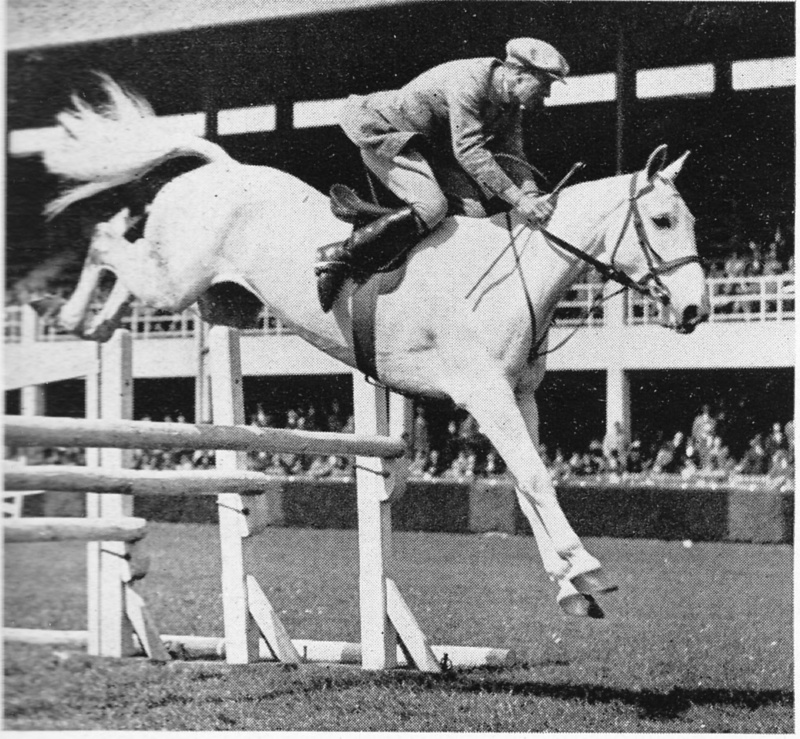 And then Baron does venture on to more dangerous ground – should steeplechase jockeys ride as short as they do? Might not riding a hole or two longer be both safer and pleasanter? He certainly had a point. Stirrup lengths in racing had shortened to a quite staggering extent, as you can see from the Grand National winners below. But Baron does not answer his question. I suppose the answer was then, as it is now, that effectiveness sometimes trumps style. Caprilli did not commit much of his work to paper, but his adherents did. Foremost among them was Major Piero Santini. There is an excellent article on him on Eventing Nation. 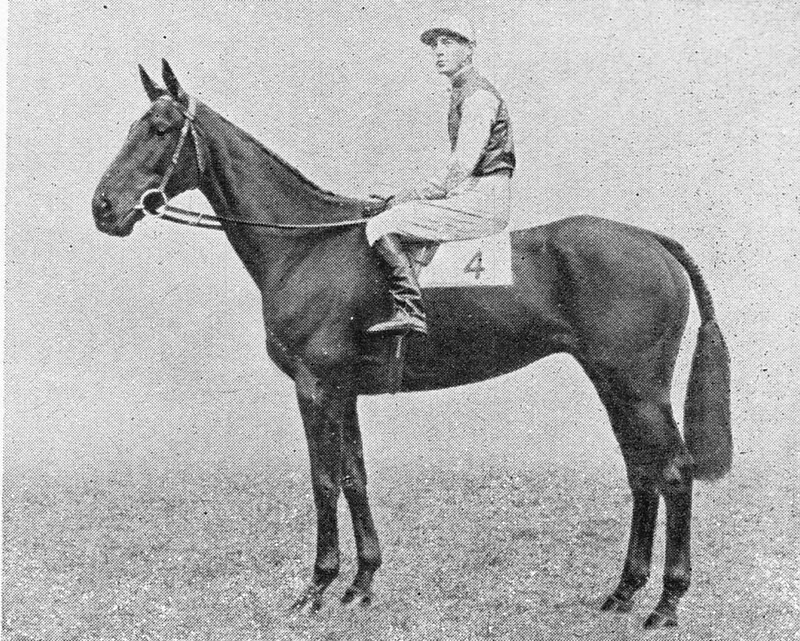 I found a 1920s video of a Berlin horse show, which gives you a nice introduction to a whole array of approaches to jumping: many, it must be said, using the classical forward seat, but there's the odd backward seat, and a few hailing cabs as well.